My wife and I were having lunch at a local diner and saw the above sign on the wall at the end of our table. She read it. I read it. She laughed. I laughed. Given that we're both lawyers, we wound up spending much of the meal trying to figure out just exactly what the hell the restaurant meant to say. Okay, so maybe not the stuff of Jackson Browne's Lawyers in Love but at least Lawyers at Lunch. Figuring that no one would believe me, I took a photo of the sign with my cellphone. I now offer Exhibit 1 for the Prosecution. I am a long-time critic of the tortured language that lawmakers employ when they draft regulations for Wall Street, or, for the matter, for virtually all laws by which we are governed. As best I can tell, the formula is to start off with bold slogans that are calculated to achieve sound-bite status in the media. Then the politico contacts all those in favor of the proposition and sees how much money they will donate to the upcoming re-election campaign or a somewhat shady non-profit organization. Then that same elected official contacts all those who oppose the proposition and determines how much these folks will donate to the same campaign or non-profit. Cash register politics! Next, the representative of the people takes out a calculator and adds up the total for the deposits from the pro's versus the deposits from the con's -- of course, let's not get silly here, it's not as if so much as one cent is going to be returned to either side. Everything makes its way onto the deposit slip. You got your principles and then you got principal that earns interest. No point in confusing the two. After your bank deposits are cleared and you determine on which side your bread is best buttered, you make a choice. With your personal telethon completed, you either continue pressing forward with your original proposition, or, with the benefit of some persuasive bucks to the contrary, you suddenly tone things down. In fact, depending upon how well-financed the opposition appears, you may even have an amazing, religious-like conversion and suddently realize that your adversaries have some good points. And to prove your sincere change of heart, you might stand in front of the mirror, just before you call a press conference, and practice the various pained looks and oratorical skills that will convey your honest-to-goodness about face. I mean, geez, once you can fake sincerity, you have it made. At some point, when the phone lines are quiet and the flow of checks is a mere dribble, our elected officials tell us that we're going to get a new law, a change for the better, reform -- and it's going to have teeth, and with a bite, and, you know, this time, seriously, no kiddin', things are gonna be different. At first blush, the proposed law looks good, and if you weigh law by the pound, well, this one has heft. However, what we get for a law is so eviscerated with exemptions, exceptions and elastic language that it is nearly incomprehensible. You can read it but you can't explain it to anyone, and you don't really understand it. At best, it's indecipherable garbage. Alas, we now arrive back to the sign that my wife found so hilarious at the local diner. "$5 Minimum Per Person At Tables," is a straight-forward proposition. You want a seat at a table, then you have to spend at least $5. But that's not all the language on the sign. Someone couldn't leave well enough alone. They had to clarify it -- add a few more words as a flourish and finishing touch. It's akin to the handiwork at which the back-room, under-the-table, dirty-dealing politicians excel. It's copywriting legerdemain. "No Substitutions Please." What exactly can't you "substitute?" No substitution for the $5 minimum? How exactly would I even attempt such a prohibited act? 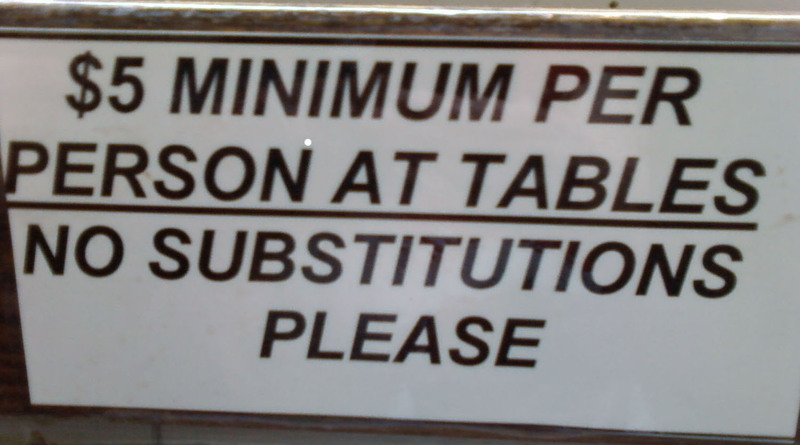 No substitution for the "per person" at the table? Meaning what? If Jack and Jill sit down at the table and each orders at least $5, then Jill can't get up before the order arrives and allow Joan to take her seat? No substitutions "at tables"? Does that mean that I can't switch my table for another one in the restaurant or that once I sit down and order from station 3 that I can't move my party to station 4? Of course, since I'm ever the lawyer, what happens if I order the $15 lunch special and my wife orders only a $2 cup of coffee? Does that pro-rate out to $8.50 per person at the table, or have I illegally substituted in violation of the posted policy? If my wife isn't hungry and I want a $6 hamburger, a $3 soda, and $3 slice of pie, can I order the hamburger for me; the soda and pie for my wife -- but after it's served, can I simply drink my wife's beverage and eat her dessert? Otto Von Bismarck said that "Laws are like sausages, it is better not to see them being made." Thankfully, the Iron Chancellor never sat down in a local diner for lunch. Of course, if he did, he would have had to order at least $5 without substitutions.